In the 1920’s, EDITOR HUGO Gernsback came up with a revolutionary idea in the field of publishing: produce a monthly magazine devoted entirely to science fiction. He called it Amazing® Science Fiction Stories. The first issue appeared in April 1926.▮This fact alone makes Amazing Science Fiction Stories remarkable. What is even more remarkable, however, is the fact that Amazing Science Fiction Stories has been in publication continuously since that date. 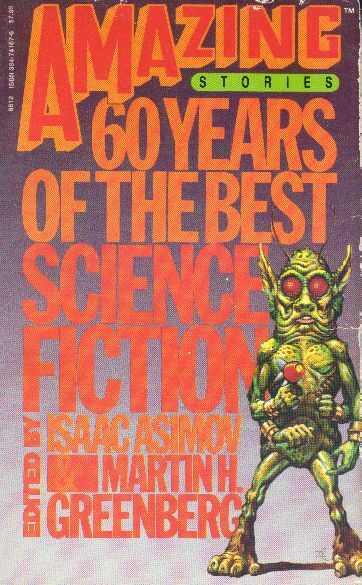 As the editor of this collection, Isaac Asimov, states in his introduction, ”This means that there is a continuous stretch of sixty years of issues from which to choose stories. No other magazine covers such a gap of time or offers such an overview of changing fashions and styles…”▮For many modern science-fiction writers—including Asimov himself—Amazing Science Fiction Stories was their introduction to the genre. They read the magazine when young and wrote for it during their later writing careers. Some of those are included in this anthology.▮Amazing Science Fiction Stories lives today. The young unknown authors who write for it now may be the notable authors of the next generation. This anthology reminds us of our roots and take [sic] us into our present—all in celebration of our future. This is a moderately impressive anthology whose purpose, it appears, is not to illustrate the long, tortured history of Amazing Stories (since, after all, no stories are included in the book published during the magazine’s nadir, 1940-1953, as the introduction carefully points out), but to show, I guess, how wonderful and innovative Amazing Stories is—so rush out and subscribe today, today, today! It has a good selection of stories, on the whole, including Asimov’s own “What Is This Thing Called Love?,” Eando Binder’s strangely neglected “I, Robot,” and a number of others which are generally OK and sometimes very good. So does it fulfill its purpose? I’m not sure, but I’m doubtful. I have, in fact, purchased a number of issues over the years, I’ve never subscribed, nor did reading this book make me particularly want to; and the circulation for the magazine continued to drop throughout the 1980’s. Despite several attempts at a comeback, it no longer even exists. As an anthology, this book is OK, but it somehow seems vaguely pointless, all things considered. Still, the stories are usually pretty good, so I suppose it’s worthwhile as an afternoon read, if nothing else.